It's time for September's new release at Whimsie Doodles. There are four images in this release and they are super cute. We are so excited to share these images with you as we are just now back from our summer break. And boy oh boy - we are all coloring up a storm! I used the Tooth Fairy Abby image from the new release and attached her to a tooth receipt tag. 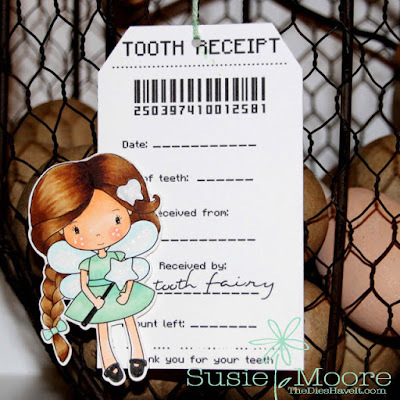 Who wouldn't enjoy getting a keepsake in place of a lost tooth? Of course, money too! Have a great day and I'll see you right back here tomorrow with our Whimsie Doodles monthly challenge.